As members of my friends and family continue to adopt iPhone smartphones, I find myself recommending the same must-have apps over and over. I thought I’d throw together a quick post to describe them here. These are the apps that I use on a regular basis and that I recommend to new iPhone users whenever I get the chance. 1. 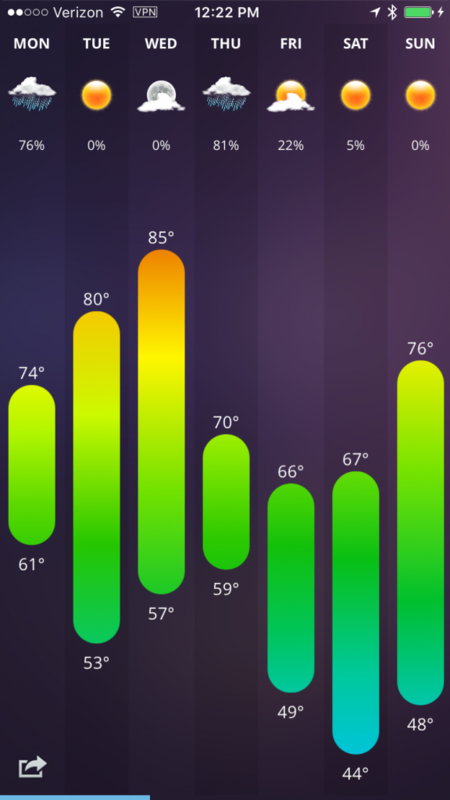 TODAY WEATHER – I’ve tried a bazillion weather apps over the past several years, and this is the only one I’ve stuck with. It has a beautiful interface, easy-to-read temperature and precipitation forecasts, and operates quickly and cleanly. Highly recommended. 3. CAMERA+ (Camera Plus) – The camera app I use 95 percent of the time. It has earned a spot on my phone’s home screen. Great filters, including the amazing “Clarity” filter which brings out details in otherwise dull photos. Image stabilizer, timer, burst mode, etc. Just get it! 4. SPOTIFY – Play music from a library of millions of songs. Since discovering Spotify, I no longer use Pandora and almost never listen to my own music collection (because I can build playlists in Spotify using millions of songs I don’t have in my collection.) Share playlists with friends, subscribe to playlists by others, and even listen to music when you’re offline. 5. 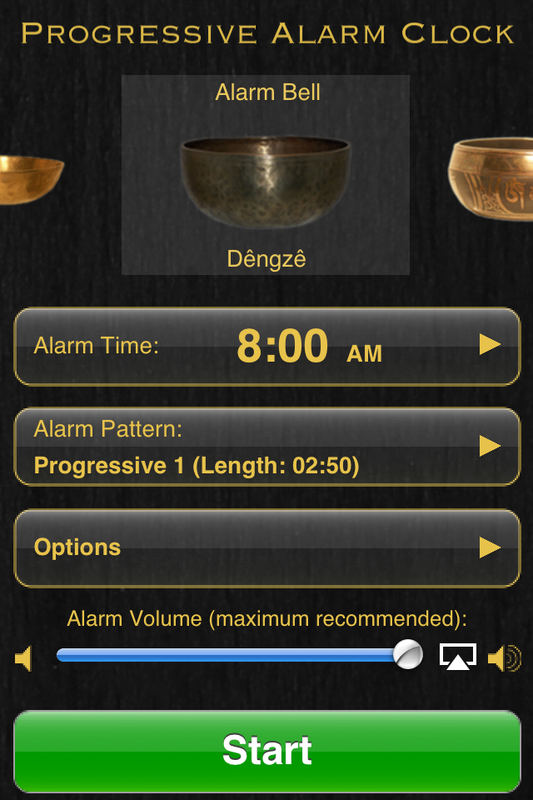 PROGRESSIVE ALARM CLOCK – Wakes you up gradually with the soothing sound of a Tibetan singing bowl. The bell starts by ringing softly (almost inaudibly,) then gradually gets louder and more frequent. I absolutely LOVE this app and use it to wake up calmly every single day. 6. RUNKEEPER – Tracks, maps, and times your runs, walks, bike rides, hikes, etc. Get detailed stats about your pace, distance, and time. See a map of your route, and share them (if you wish) with friends and family. 7. GOOGLE SEARCH – The voice search in this app works much faster than Siri, and will speak many of its results back to you. I use this app all the time and ask it things like “What time is it in New Zealand?” or “How old is George Clooney?” or “Will it rain tomorrow?”. You can also type in your search terms if you wish. I can usually find things faster with this app than I can by launching a mobile web browser. 8. FANTASTICAL – I replaced the built-in iPhone calendar app with Fantastical and never looked back. This app provides much better calendar views (week overview, agenda overview, etc.,) and offers a much more usable, better-looking interface than the standard iPhone app. It also integrates reminders into your calendar. This is another app that has earned its spot on my home screen. 9. YAHOO NEWS DIGEST – A really cool, quick way to stay up-to-date on the day’s most important news. Yahoo News Digests are delivered twice a day – once in the morning and once in the evening. All the top stories are summarized and presented with the key information that you need to stay on top of what’s happening. 10. SLICE – If you shop online, you need Slice. It automatically processes shopping-related emails to help you easily keep track of your stuff. Slice securely retrieves all shopping and shipping notices from your email account(s), then tracks all your deliveries in a single place. 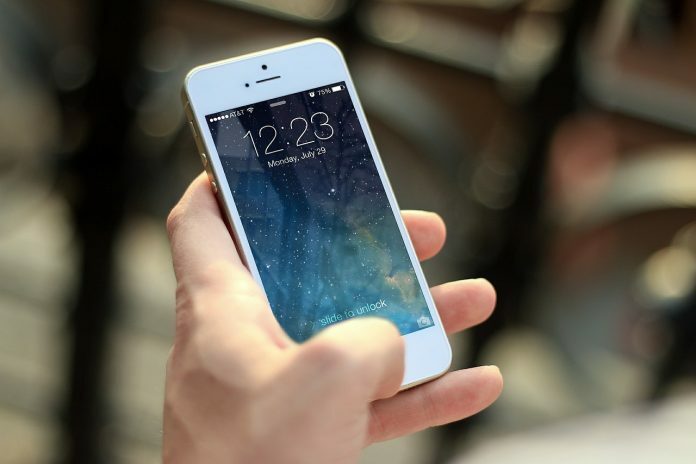 It can send you push notifications when a package is out for delivery, or when it’s delivered to your home. Slice saves me hours every year.